Other Products: White cardstock, Pink Shiny Cardstock, Green cardstock, Foam tape, Glue gun, Pink ribbon, Pearl pen Creme, Distress Ink Vintage Photo, White Seam binding Ribbon, Crop-A-Dile, Green Small stamens, versa mark. Instructions: See more photos on my blog here. Cut a piece of Pink Shiny cardstock at 12 x 8", put it on the scor pal and score it in half, then your card is 6 x 8 inches. 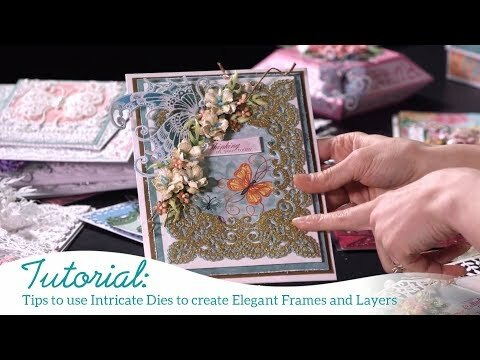 Cut the Big Eyelet lace Frames Die out of white cardstock and glue this on front of your card. Now take the second size of the Eyelet Rectangle & Basic die and cut it out. Place the Swirly Butterfly Dreams Border die in the Middle, cut it out and glue this card on top of the card on the other frame. 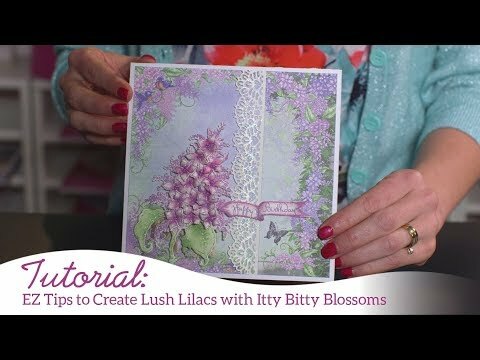 Take a piece of the pink shiny cardstock and stamp the Butterfly Dreams Border with Versa mark Ink on it, put the white Embossing Powder on top and melt it with the heat tool. Now cut it out with the coordinating die, put Foam tape on the back and place it on top of the card in the other cut you made. Now we go to the inside, we decorate later! For the Left inside, cut a piece of the pink cardstock at 6 x 4", now cut out the strip from the Butterfly dreams Border Die from White cardstock and cut it at the same size as the Pink 6 x 4" and glue this on top of the pink cardstock. We are making a pocket so put glue on the 2 sides and bottom only and glue it down on the left side. Cut a piece of pink cardstock at 4 3/4 x 3 1/2". Now cut the half round doily out from the Frame a card Leafy Borders Die out of white cardstock and place this on top of the label. Cut the edges off and let it stick out on top a little bit. Make a hole in it with the Crop-A-Dile and put the Ribbon through it. Bind the ribbon together with the white Seam binding and put it in the Pocket. Cut the Intricate Swirl Frame Die out of White cardstock and glue that on the inside on the right side of the card. Now take a big piece of the pink ribbon and fold it around the card from top to bottom and make a big bow on the front of the card. For the Flowers, stamp with the Rhubarb Stalk and the Large Sweet Peony stamp set 5 flowers on white cardstock and color them with the Pearlescent Poppy Ink. Cut them out with the coordinating die and shape them with the Deluxe Shaping kit. Glue 5 on top of each other, make a hole in the middle and put some stamens in the hole. Do the same for the small ones, but then I used 1 big stamen. Stamp with the Tuxedo Black ink 2 different branches from the Rain Boots and Blossoms on white cardstock, color them Green with the bamboo Leaves and the flowers on the second one I did them with the Rose Bud. Stamp with Tuxedo Black and Rich Cocoa the Rose Vines, Color them with the new Sprout and bamboo leaves and on top some Vintage Photo and some Rose bud. Cut out the second size Poinsettia of Green Cardstock, make it wet and twist the ends between your fingers so that they all curl up, let them dry and place them on the back of the rose. Now make a nice arrangement with all the flowers on the front of your card.